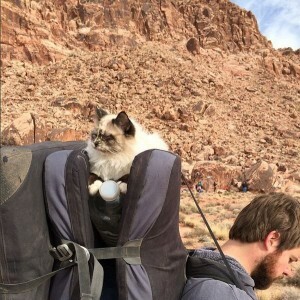 Hiking with a cat may seem strange or even impossible, but it’s not only possible — it’s also becoming quite common. 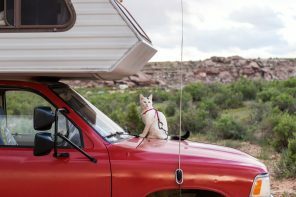 You may assume that cats are content to while away the day dozing on the couch, but many cats actually enjoy exploring the outdoor world, and these adventurous kitties would love to accompany their owners on a hike. In addition to providing mental stimulation, leash walking a cat can be great exercise for your pet. 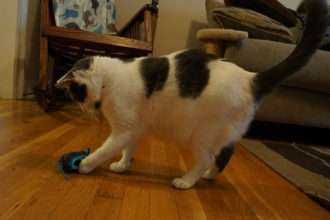 It may even ease pain for some cats, such as Marcus, a kitty at Best Friends Animal Society that suffers from a condition called Manx syndrome that affects his spinal cord and muscles. 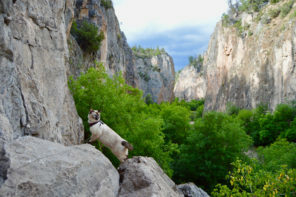 However, before you hit the trail with your feline friend, make sure your cat is in good health and familiarize yourself with the hiking tips and safety guidelines below. This means having a kitty that’s comfortable wearing a harness and walking on a leash. 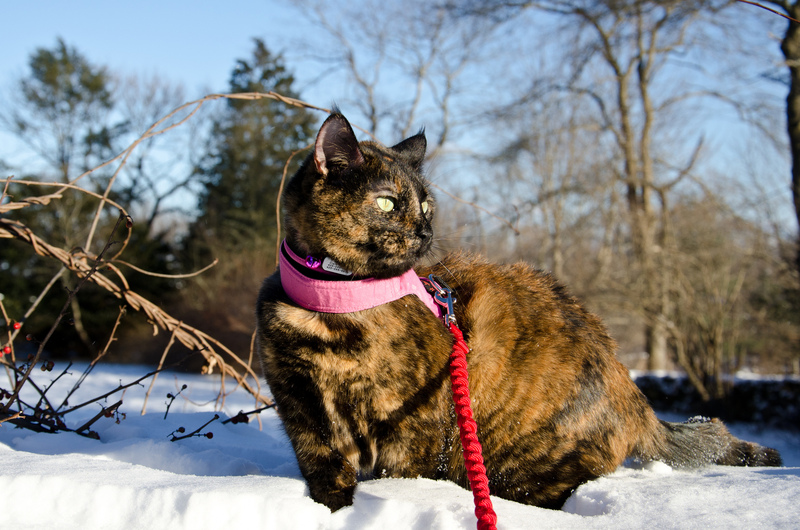 Your cat’s first trip into the great outdoors shouldn’t be on a popular hiking trail — or on any trail at all. Start leash training in your home, move into the yard and then try out a quiet outdoor area to help your cat get acclimated to new surroundings. 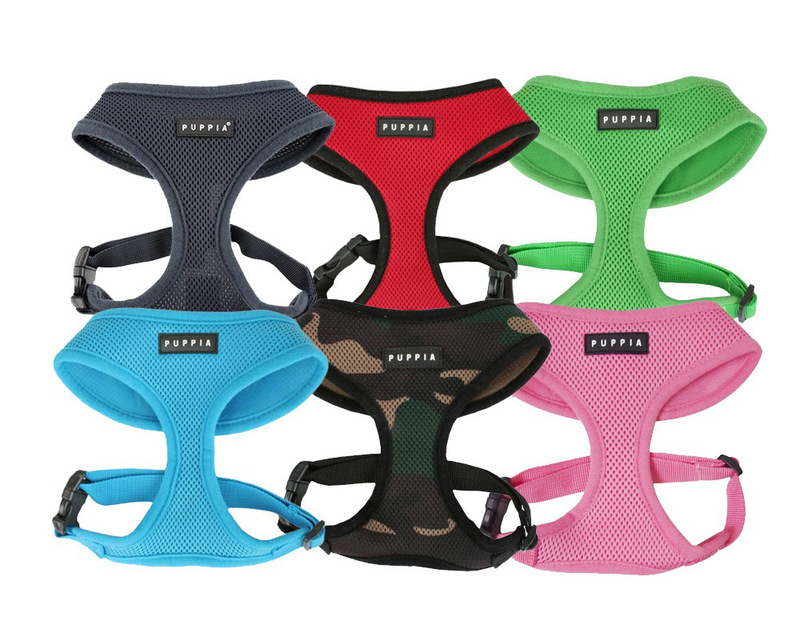 Learn more about leash training. It’s also a smart idea to teach your cat to come when called. Accidents happen, and if your kitty suddenly finds himself off leash for the first time, you want to know he’ll come right back at the sound of your voice. In addition to your hiking boots and your cat’s harness, you should also pack these 14 essentials to ensure you’re prepared for just about anything. Is your cat vaccinated and on flea, tick and heartworm prevention treatment? Don’t take your cat outdoors where she could be exposed to unvaccinated animals, fleas, ticks and heartworm-carrying mosquitoes if she isn’t up to date on all of these. Is your cat microchipped, and does she have a collar and tags? Your cat should always wear a collar with easily readable identification tags that feature your name, address and phone number. A microchip is a good idea as well. How tough is the trail? 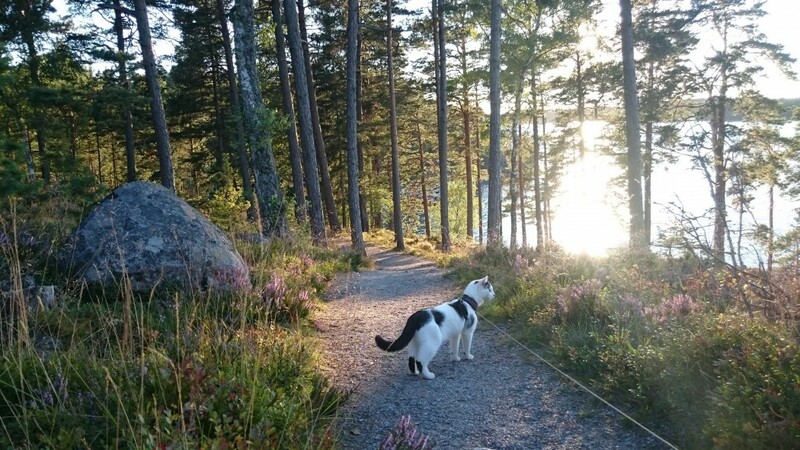 Take your cat’s age and fitness level into account when choosing your trail. Older cats and those with medical conditions may not be able to cover long distances or rough terrain, and kittens shouldn’t be expected to hike for long periods of time or be allowed to climb or jump too far as their bodies are still developing and they could easily break a bone. 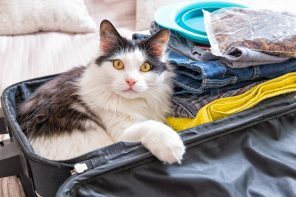 If your cat is accustomed to only walking (or being carried) for a mile or two, don’t suddenly spring a 10-mile trek on your unsuspecting feline. Even if your cat enjoys the occasional swim, she may not care for hiking in the rain. Also, consider the length of your cat’s coat — or lack of coat — before heading out on a particularly hot or chilly day. If your cat is a hairless breed or has fine, light-colored hair, she may need sunscreen. Keep your cat on a leash and harness. Even if your kitty never wanders too far and always comes when called, consider the potential dangers your pet could encounter. A quick dash through poison ivy will result in urushiol — that oily itch-inducing allergen — getting onto your cat’s coat, which can easily spread to you. Your cat could also chew on a dangerous plant or drink from a stream that contains harmful bacteria. There’s also the threat of wildlife. Your cat could chase after a squirrel and disappear into the woods — or chase after a snake before you can grab the leash. And then there are the coyotes, mountain lions, birds of prey and countless other animals that may see your kitty as a meal instead of a cherished pet, so play it safe and keep that leash on. Be prepared to pick your kitty up. If you encounter a threat — even if it’s simply an excited child or a leashed dog — pick up your cat. 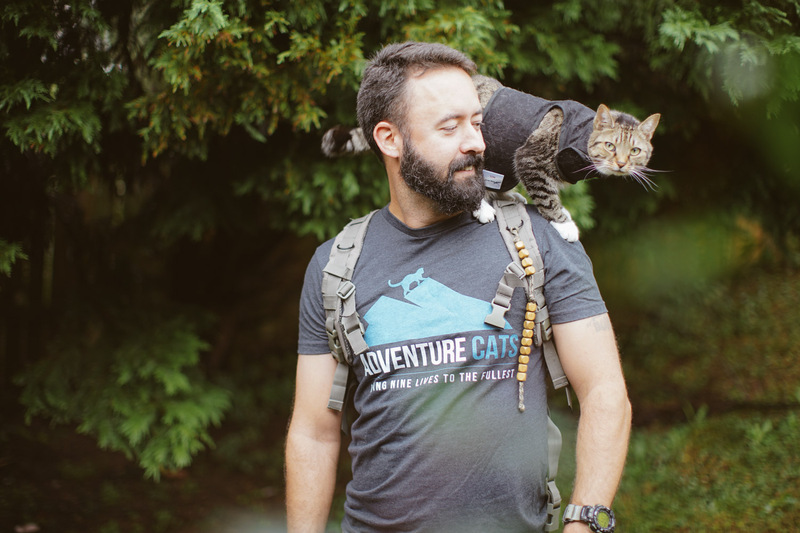 Cats feel safer when they’re up high and have the visual advantage, and you’ll feel safer knowing your kitty is in your arms, on your shoulder or perched atop your pack. Also be ready to give your cat a lift if she’s tired, the terrain is tough or it’s a particularly hot day. Your cat may love being outside but only want to explore every now and then, so make sure she’s comfortable nestled in a backpack or perched on your shoulder. Hydration is important for both you and your cat so bring along plenty of water, and familiarize yourself with panting and these other signs of dehydration from the ASPCA. Never let your cat drink from streams, creeks, ponds or any other water you may encounter on your hike. It could contain parasites like Giardia or bacteria that can cause infections. Learn more about preventing dehydration in cats. In addition to pausing to pour some water in your kitty’s bowl, be sure to fuel yourself and your cat with food. While you may want to much on trail mix, your cat will be purrfectly happy with some favorite treats. 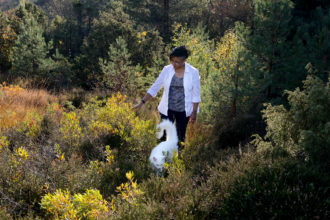 Keeping to the marked path will help you avoid getting lost, prevent erosion and protect potentially threatened plant life. Always abide by the seven principles of Leave No Trace, which means packing out all your trash — including kitty waste. 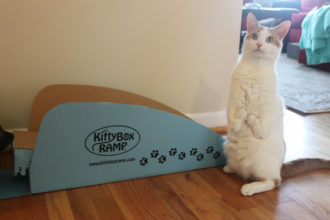 There are many collapsible and lightweight litter boxes that can help your cat do their business in an eco-friendly way. 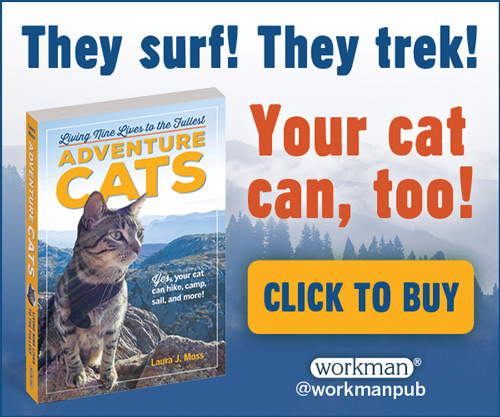 Before you take your cat outside, please familiarize yourself with these adventuring best practices. I make my own dehydrated backpacking meals, and I dehydrate some tuna and salmon for Tuxie. Lucky Tuxie! Sounds purry delicious. I love this site! 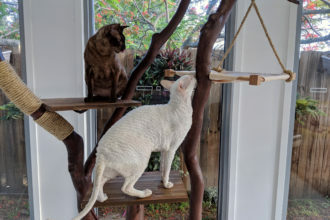 We bought our cat a harness last Christmas, and took him outside, which he loved, but he would only plop down on the ground and not move – the same thing he does when he goes out in the lanai. I would love to take him out and about… not sure we will ever get there though! my cat is so stubborn… she never comes when she is called when she’s outside. tuna or kitty treats don’t excite her when there is so much fun thing going on outside. how can I train her to come when called outside? and also, we end up following her when she’s on the leash because I guess she doesn’t like being led around. can someone give me some tips? ?